Anyone else ready to shed the layers and start enjoying some time outdoors? I’m dying to get outside and soak up a little sunshine. Over the past few years of overhauling our yard we’ve been focusing on the big stuff, like building the deck around the pool, sprucing up down by the lake and building the side patio. 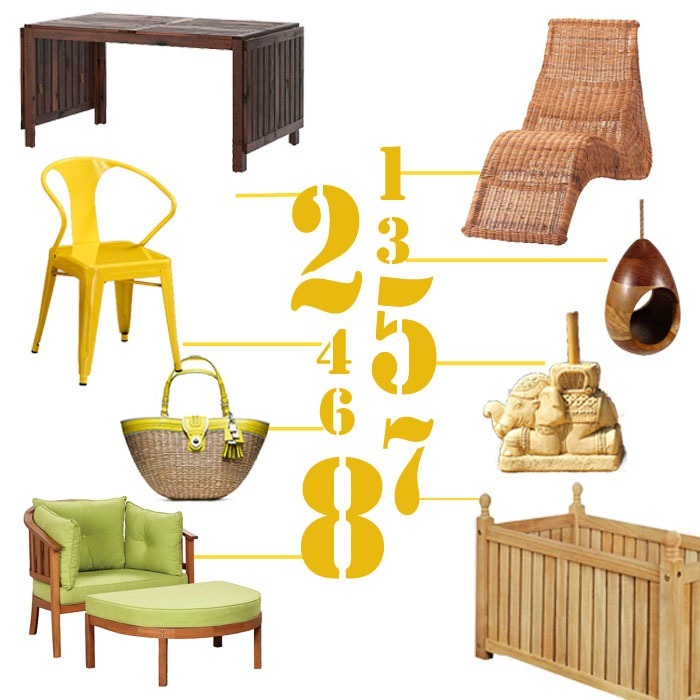 All that work left little in the way of time or budget to furnish all those new outdoor living spaces. But this year I’m declaring that we will get some outdoor Magliette Calcio A Poco Prezzo furnishings. Bryan and I have been keeping our eyes open for some affordable (him) yet stylish (me) furnishing for the great outdoors. 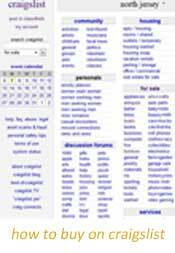 Care to take a peak at what we’ve found? Yesterday I mentioned that Bryan was helping out my Dad for a little bit while he began installing radiant floor heating downstairs. Our house is a mother/daughter arrangement. 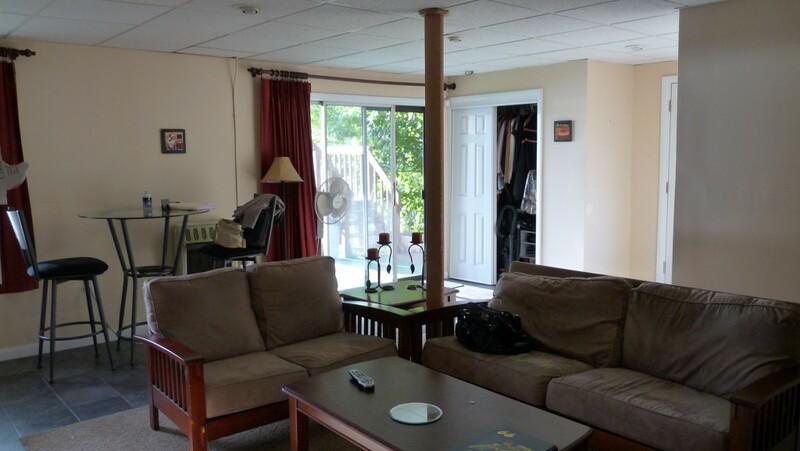 We live upstairs with 2 bedrooms, 1 bath, eat-in kitchen, living room and a large deck . My parents live downstairs and have 1 bedroom, 1 bath, living room, kitchen and a patio. 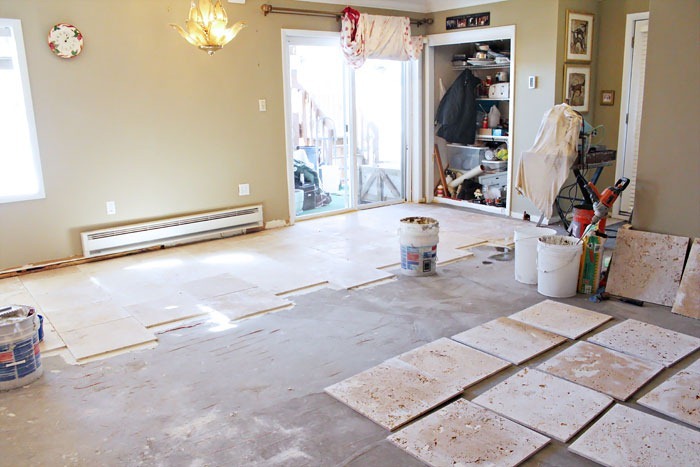 I haven’t shown the downstairs on the blog for a while, this is what the downstairs looked like on the day of our home inspection. They previous owners used it as a mix of summer kitchen and living area. On the floor there was both slate and carpet tiles. 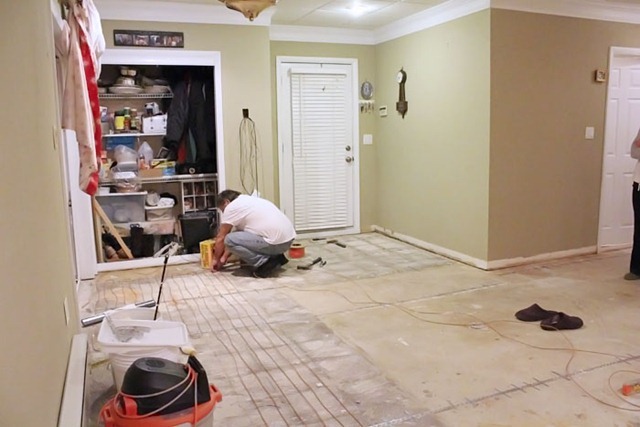 Since moving in they have removed the column and installed a larger beam to support the span, raised the drop ceiling (there was a ton of wasted space up there) and now they removed the tile and carpeting to install new marble flooring. Pulling up old tile is no easy project, it’s messy and dirty and requires a lot of elbow grease. 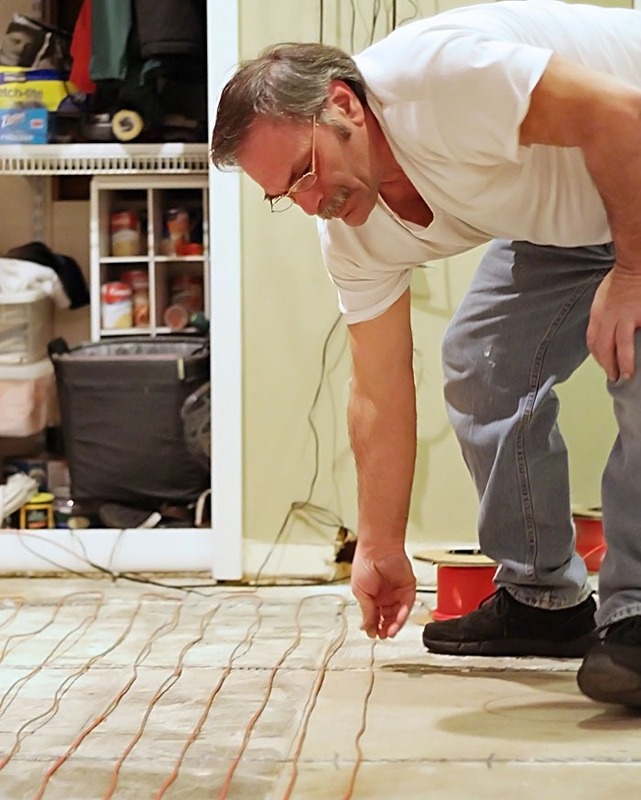 So since the floor was entirely removed anyway my Dad decided to install in-floor radiant heating. 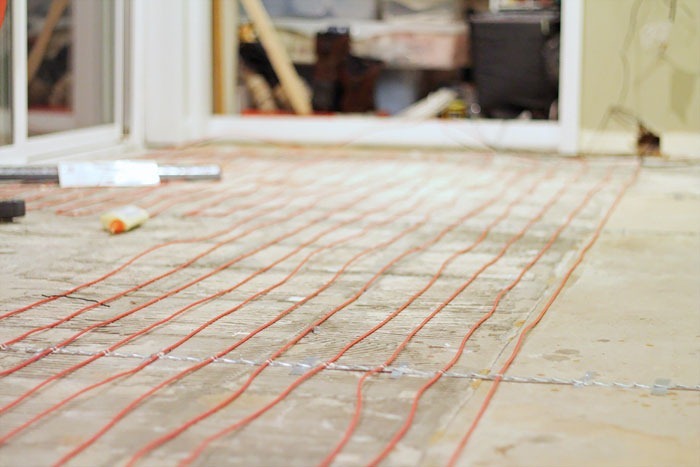 In-floor radiant heating is basically low voltage wires run directly under your floor. It warms the room from below and eliminates that cold tile feeling that’s so hard to shake in the winter. My Dad is the ultimately DIYer, we have always done projects like these even back when Bob Vila was the only home show to watch, so it was no surprise when he went on the internet, bought a couple books, read up on it on the Ray Ban Baratas internet and began laying the wire. There’s an alternate method where you can buy mats with the wire pre-layed out for you. But it turns out that have it pre done costs about 4 times more ad for a floor this size it just didn’t make sense. It took a little bit of trial and error to get the wires to stay in place. There are metal strips glued to the floor every three feet to help hold them in down but in between they tended to get loose and float up. After reading a few tips on the internet, he heard that you could actually hot glue them into place to help them hold. Now I don’t know if that’s an officially sanctioned way to do it but It worked like a charm. 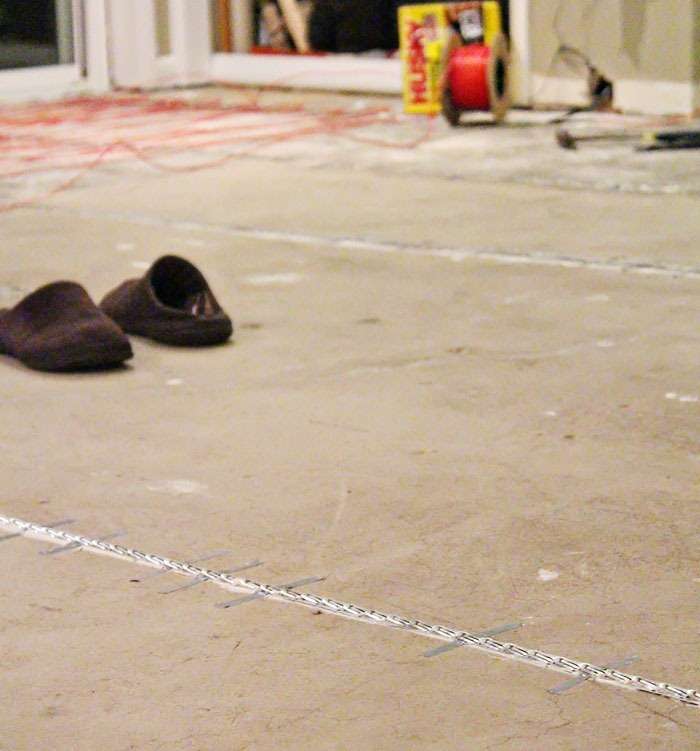 After the wires were secure they poured an entire coat of self leveling cement. Self leveling cement is a very thin almost watery consistency. 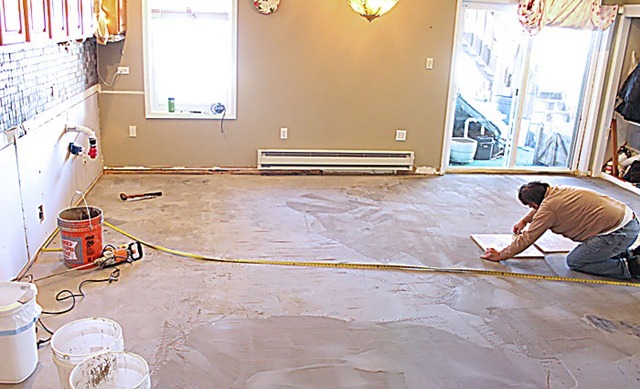 Once mixed, you pour it over the floors to help ensure a level surface. You need to work quickly though and in sections because it only has a 20 minute workable time before it begins to set and dry. Once dry the cement covered the wires protecting them and what’s left is a nice smooth surface for the tile. You can see even with all the gluing a few of the wires tended to float up out of the self level cement anyway. Although not ideal in then end it worked out OK as the thin set that was used to set the tile covered it enough to not make a difference. It was seriously a lot of work but the floors are coming along now and they look gorgeous! I’ll keep you all posted with how it goes and let everyone know how we like the in floor heating. So it’s Monday again, how was your weekend? We had an all-over-the-place kind of weekend (kind of like this post). On Saturday, Bryan helped my Dad out downstairs for a little while. Did you know my parents live downstairs? Yup they do we live in a really great mother/daughter house with 2 of everything. 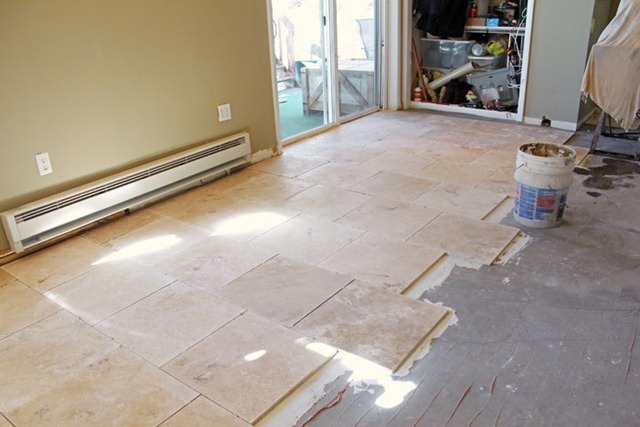 They’re redoing their floors and installing radiant floor heating as they go. The heat warms the floors from Cheap Oakley Sunglasses underneath. He’s installing it himself so there is a bit of a learning curve. 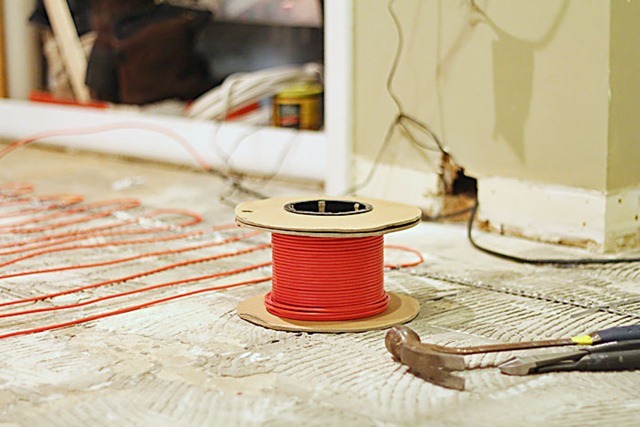 The quick overview of it is that you run wires under the floor and pour a self leveling cement over the top to hold it in place before tiling. There’s my dad laying out the wires that will produce the heat. Bryan and I also made a trip to the paint store. I finally settled on a a white to paint the Living Room. It’s called Vapor from Benjamin Moore and it was the warmest of the samples that we put on the wall. I can’t wait to get to painting to see how it looks! 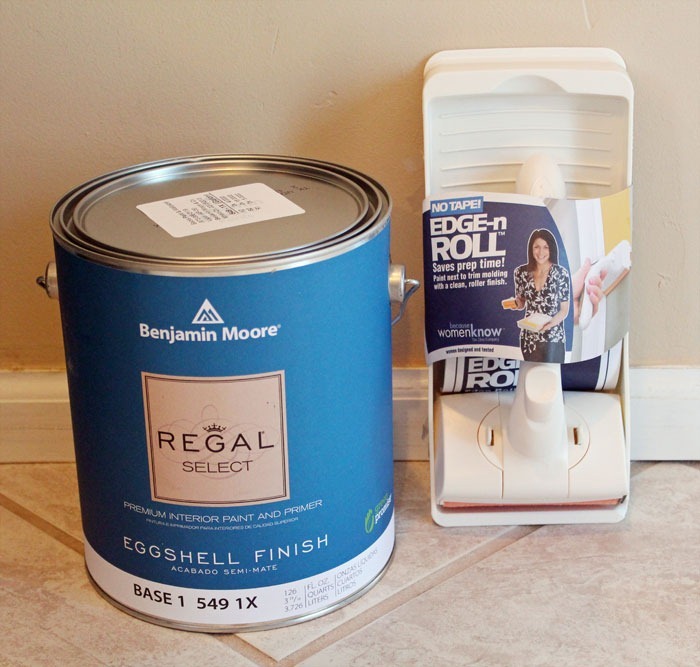 We also picked up a no tape edge-n roll edger to help do the edges. It was $15 and normally I wouldn’t have bought it but my sister tried it out last time she painted and loved it. We’ll see how it goes. 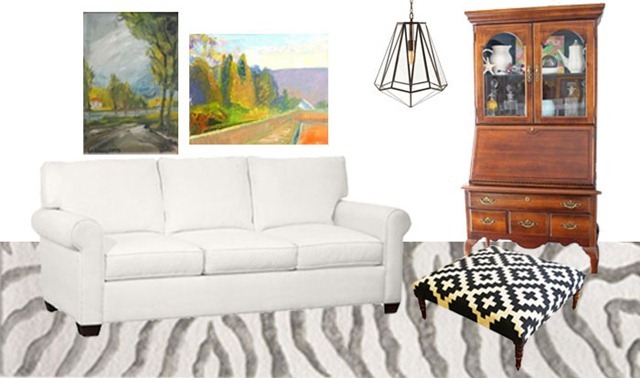 I also played around by putting together a quick living room mood board. I wanted to see how both the old and a few new elements would work together. Our couch is the Buchanan sectional from pottery barn and the rug is a zebra print rug from Rugs USA which is an awesome rug that I really love. We have a lot of wood tones in the room too; including the Secretary I just bought on craigslist last month which I think will help warm up the white walls and some colorful art. Right now I’m liking these here and here. I found the ottoman on One Kings Lane from a while back. I love the graphic black pattern, but unfortunately it’s not available anymore so I’m thinking maybe, just maybe I could DIY something similar. The room needs some new pillows too I’ve had the same ones forever so I want to whip up a few with some new fabric. 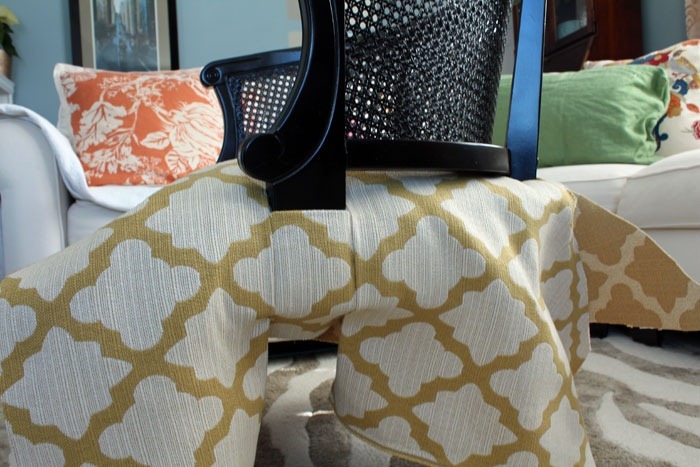 The black graphic patterned fabric called Connect the Blocks I found it on Spoonflower and it’s so similar to the ottoman fabric. I’ve always been a little shy of using black but I really want to break out of that rut. The next fabric I like right now is Landsmeer by Robert Allen. It looks like a water color printed on fabric. 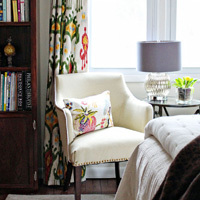 I also like this stylized paisley print from SpoonFlower and the modern floral from L&S Fabrics. A couple weeks ago I read this article on Houzz by Alison Hodson about taking a minimalist view of the things keep your home. 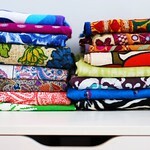 She talks about how for years she was overwhelmed by her stuff, secretly wanting it to vanish into thin air. The day she had an epiphany about why she could never keep her house clean and when a house fire took everything except the clothes on her family’s backs. 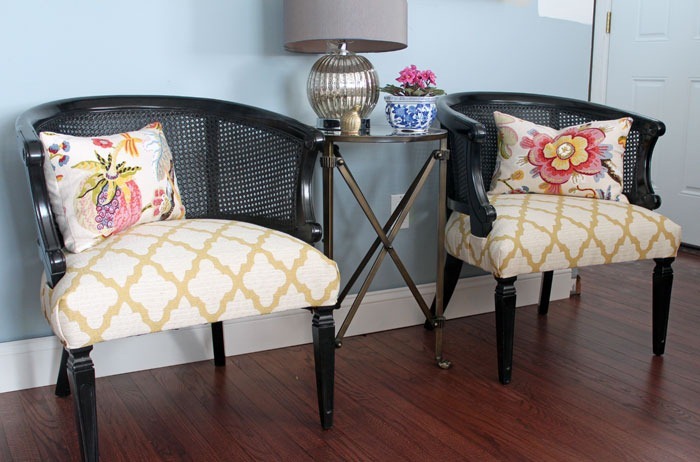 Easily the most beautifully written article I’ve ever read on Houzz. If you have time I highly recommend you read it and it’s got me thinking about all our “stuff” Most of what I show on the blog is the stuff I love but behind that in the closets and under the beds there’s always the stuff I wish I could do without. My mom was and is a relentless purger of things un-needed. It was a well known fact in our house that you shouldn’t leave anything lying about that resembled garbage cheap oakleys and expect to come back to it later. Nothing was sacred. 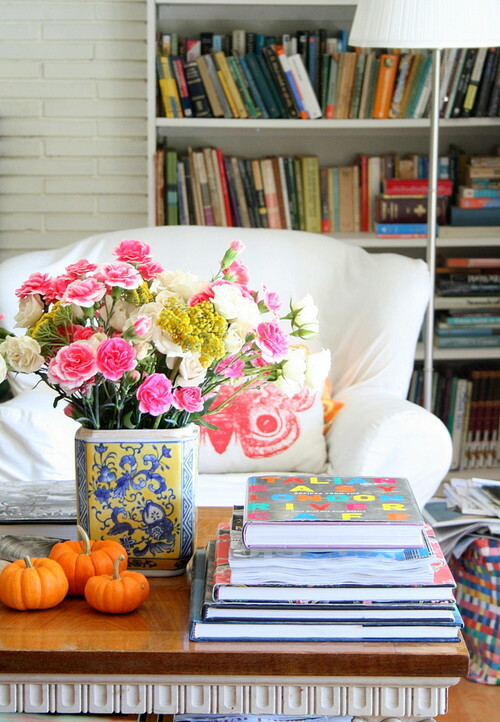 Is organizing and decluttering your home a common topic? 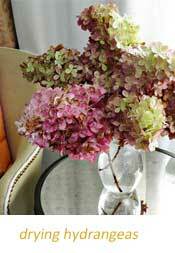 Are you continually cleaning, but your home is never really tidy? I can identify with the last two questions the most. I’ve always thought of myself as one that throws things away, but it’s clearly not enough. We still have all these things we don’t need. The funny thing about this is it has really got me thinking. Do I really need that box of baby toys I’m saving. What’s in the back of the hall closet? Do I even remember what I stashed up there? Under the bed…how long has it been since I cleaned that out? 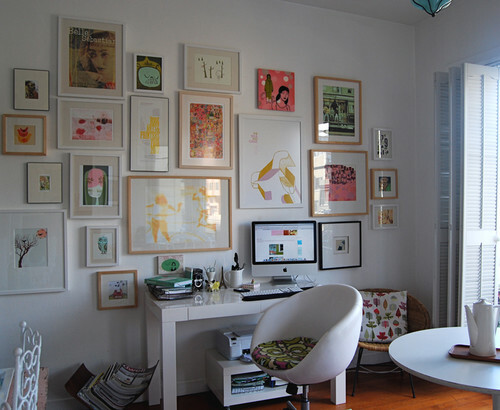 What areas of your house do you wish you could go more minimalistic with? Spill it in the comments. 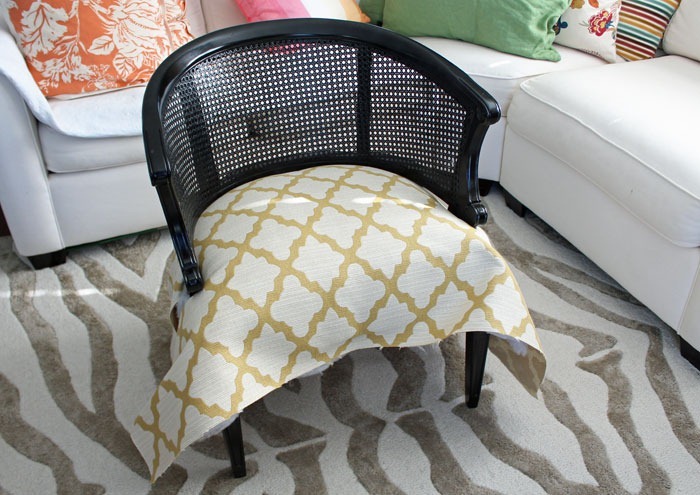 Ever wonder how to reupholster a chair seat so that it feels cushy and brand new, not saggy or springy? After working on a few chairs and reading tons of tutorials I’ve learned a thing or two about putting together a nice soft seat. 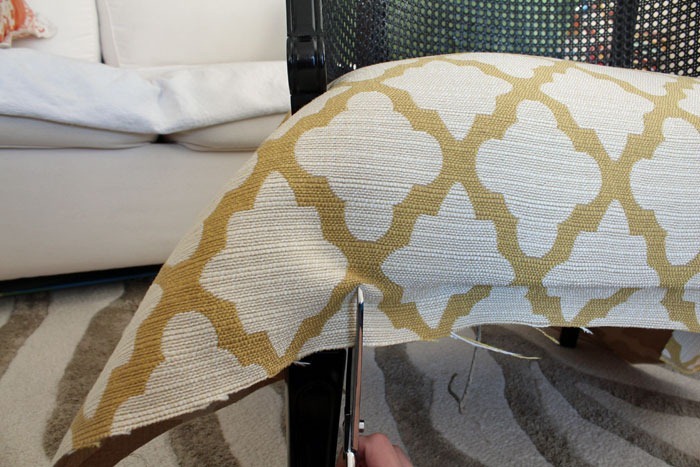 Upholstery can be totally daunting and scary if you’ve never done it before. The secret to a nice soft seat is in the layers that cover the support, whether it be coil springs, zig zag springs or no springs at all. This method will add a little cush to the tush and look beautiful in the process. 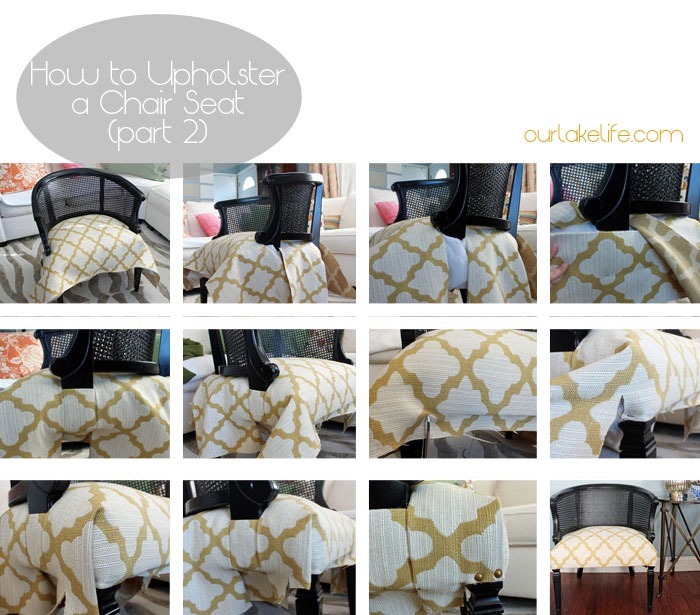 If you missed the first part of the tutorial be sure to check out part 1 of How to Upholster a Chair Seat here. Now for the part where it all comes back together and starts to look like a chair again. When last we left off we just finished putting the batting onto the chair seat. The batting is the last step before the your fabric goes on! 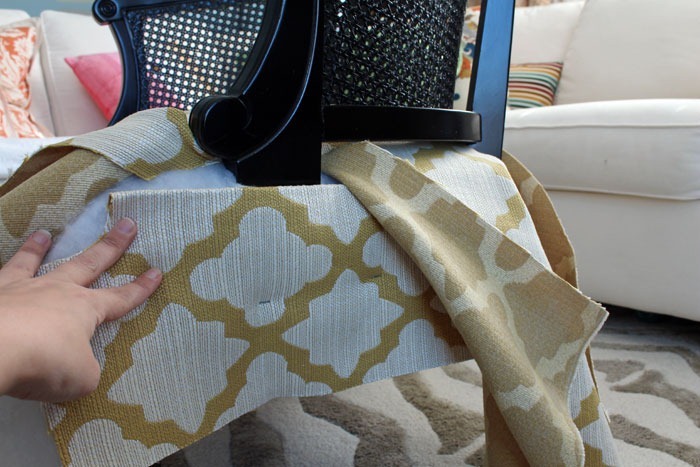 Use the old fabric you saved during the removal process as a pattern for your new fabric. If your fabric has a pattern be sure to center it before cutting it out. I like to cut the fabric a touch larger than the pattern so I have a little wiggle room for adjustment. 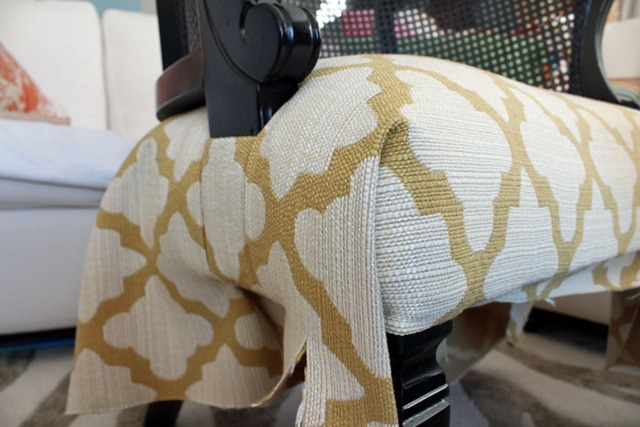 Center your fabric onto the seat and cut around the legs using the same “Y” method I showed you for the burlap and batting layers. This time it’s VERY important not to cut too far. Be sure to go slow and snip a little at a time. Here’s where the top layer differs from the previous layers. Around the legs the sides will look something like the picture above. That slit was formed when you cut the “Y shape. Now it’s time to fix that up and make a nice, clean, finished seam. 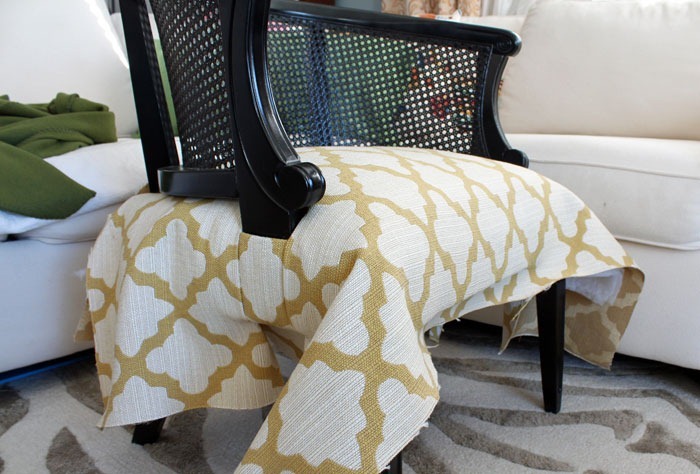 Start by folding under the raw edges of your fabric that wrap around the legs. Next cut another piece of cheap oakley sunglasses fabric, this piece will lay underneath the top layer, if you have a pattern be sure to match it up. Fold under your top edge and tack to hold into place with a few staples. Be sure to clip off any excessive amount of fabric so as not to add too much bulk. Wrap your top layer around tightly and secure with staples or upholstery tacks underneath the chair. The will hold the underneath piece in snugly and it shouldn’t move. See how matching the fabric pattern makes the seam almost disappear? Little details like these all help to achieve professional looking results. Once you’re finished move over to the other side and do it again. You should almost be a professional by now! Now that the chair legs are taken care of it’s time to move onto the front. Work out from the center and begin stapling, pulling tightly and evenly as you go. As you get to the corner gently snip up into your fabric. Be careful not to snip too far. You only want to go as high as the finished portion of your leg. Next you’re going to turn under the portion to the left of the scissor in the above photo so clip off any excess that’ll make it too hard to turn under. It’ll make sense in a second. Now you can staple all the way up to the corner. and roll under that little portion that’s left after you clipped. 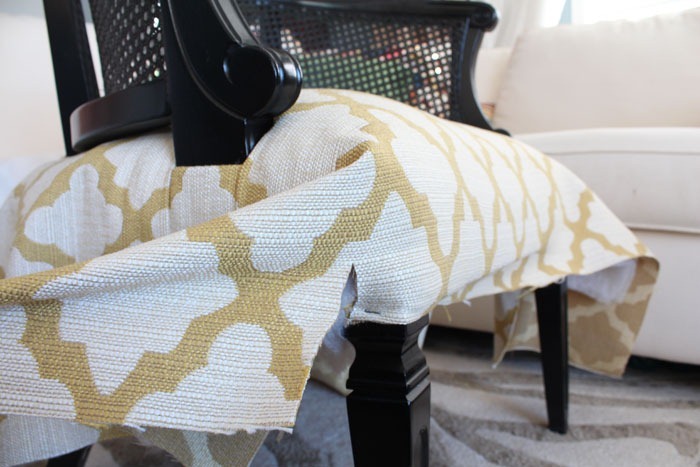 Roll under and wrap it around the chair leg, securing with a staple in the corner. This staple will get covered up in a second. 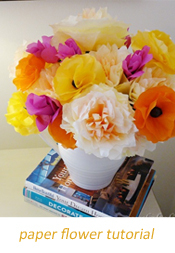 Like you’re wrapping a present or making a hospital corner on your bed fold down your fabric from the top. It’ll make a nice neat corner. 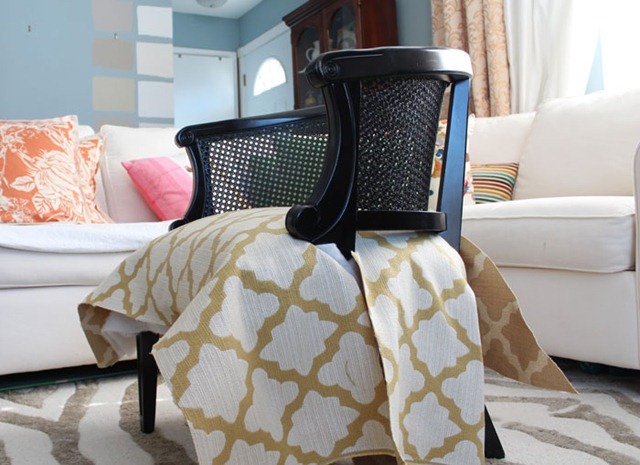 You’ll probably notice depending on the weight of the fabric you choose extra bunching underneath. Trim away any excess fabric that won’t be seen. It’ll help your folder lay nice and flat. 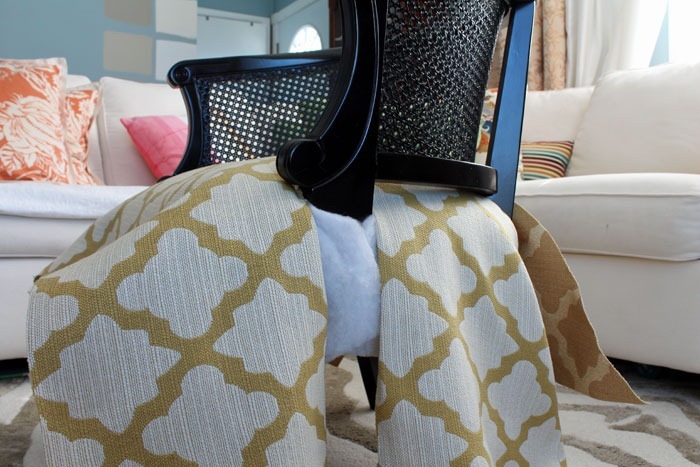 Do the same thing as you did before and cut up to the top of the finished portion of the leg and roll under around the chair leg, securing on top with a decorative upholstery nail. 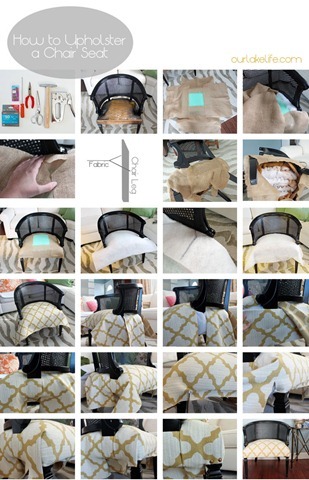 Continue working all the way around your chair pulling, folding and tucking as you go. 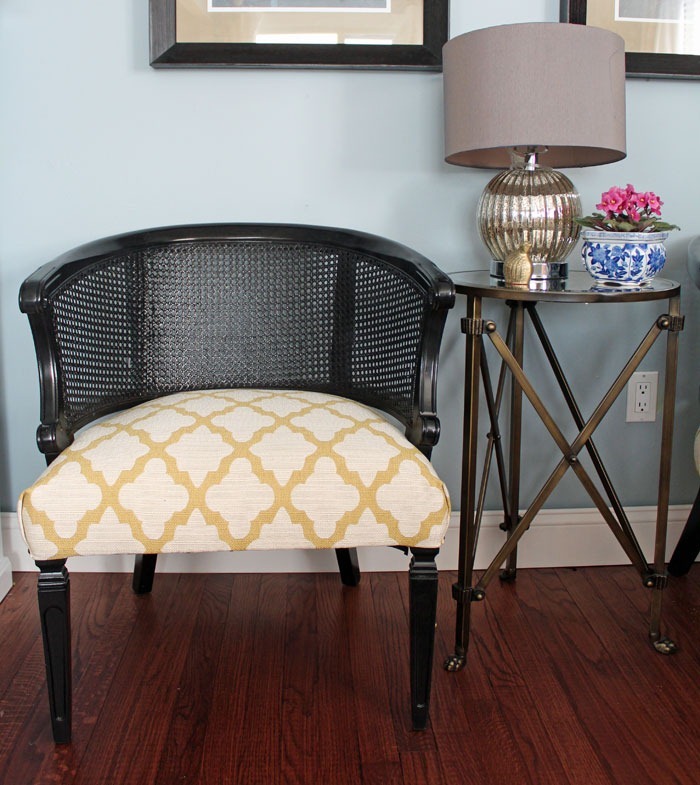 Before you know it you’ll have a completely reupholstered chair. Go slow it’s easy to get carried away and want to get it done quickly. 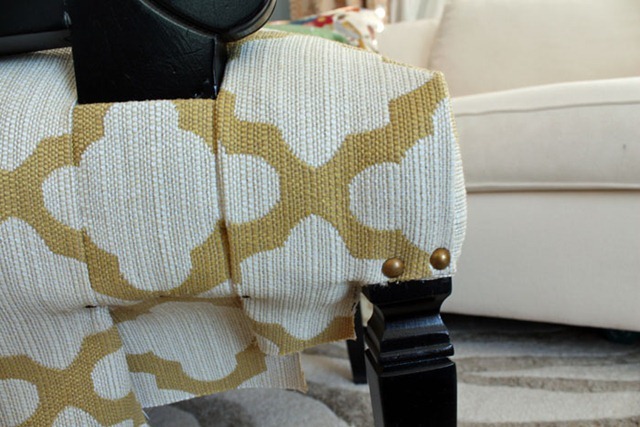 Slow and steady wins the race in upholstery. Don’t be afraid to pull out a row of staples if something doesn’t feel right. 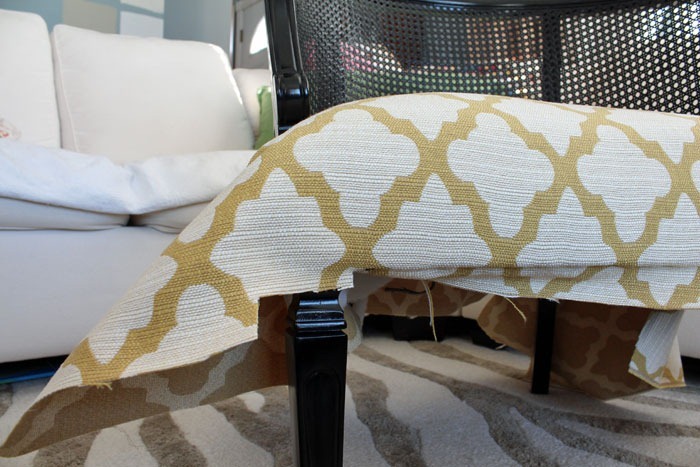 It’s ok to snip away some of the underneath fabric when you make your corners. It helps to remove the excess and lets your corners lay flat in the end. Be sure to center and line up your patterns.